UN World AIDS Day, 1 Dec.
Combating HIV has proved one of the great challenges for science ‘More money needed’ for HIV cure UN urges more funds for HIV drugs This year’s World Aids Day comes at what many scientists and campaigners agree is a decisive moment in the 30-year history of the epidemic. Although there is still no vaccine against HIV, key trials in the past year have confirmed that the combination drug treatment makes people with HIV less infectious But just as the science is bringing much-needed new results, funding is tailing off for the first time. Said Professor Francoise Barre-Sinoussi is a Paris-based virologist who jointly won the Nobel Prize – along with a colleague, Luc Montagnier – for discovering the Aids virus in 1983. ‘ The director of WHO’s HIV department, Dr Gottfried Hirnschall, said: “We feel this is a decisive moment. It’s so important at this time not to falter with committing the resources that are needed, to further bring down the level of new infections. I am not only upset – I’m furious. Cutting funds is not acceptable. ” said Prof Francoise Barre-Sinoussi Nobel Prize winning scientist “We have the interventions that can help us move to an Aids-free generation. And some countries… are increasing their domestic commitments to fighting Aids. “Our priority for the next few years is the countries that are lagging behind in progress – such as Russia, Ukraine, some of the Central Asian republics, and parts of North Africa and the Middle East. “The Global Fund announcement makes us nervous, although it wasn’t completely unexpected. It will trigger conversations about how we can sustain the essential services that are needed. “With our partners, we’ll be looking closely at which countries are at greatest risk from any disruption to their HIV /Aids services – and ensure that funding is maintained, in part through the transitional arrangements being made by the Global Fund.” Forthright Prof Barre-Sinoussi, who describes herself as an activist as well as a scientist, was particularly forthright in her views. She pointed out that in Cambodia, 90% of people with HIV are on treatment – but all patients there depend on The Global Fund. Prof Barre-Sinoussi said: “If these people don’t have access any more to the Fund in the next five or ten years, the patients will have to stop their treatment and they will start to die again. “I don’t want to see that after such wonderful effort by the politicians and the doctors there, who have worked so hard to improve the health system by organising rural networks. “How can we accept going back to zero? It’s impossible. “If you stop treatment, you get a strain of the virus that becomes resistant. And viruses don’t have frontiers. “And the scientific research will slow down. It’s not just a question of progress on HIV /Aids – the virus can teach us about abnormal inflammation and other chronic conditions, such as cancer. “We are still a group of scientists which is ready to fight – and we will continue to try and do our best.” The right to live Citing trials which have shown anti-retroviral drugs can cut the risk of transmitting HIV by 96%, she added: “This demonstrates that we’re making very important progress on all the basics. 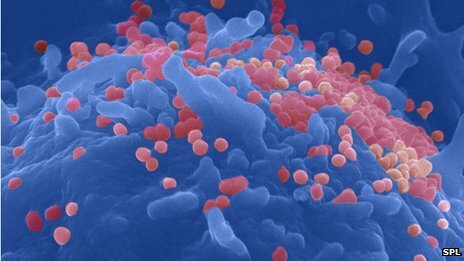 “And we’re starting to see results, with fewer new infections in some countries. It’s not acceptable that the Global Fund has had to cancel its next round of grants. “The scientists are taking responsibility – but the decision-makers aren’t. They’ll be responsible if the HIV epidemic re-emerges. “We’re really concerned that after all the scientific progress that’s been made, and how it’s being implemented, we’re going backwards. I am not only upset – I’m furious. “It’s a question of people surviving and having the right to live. Health is part of the idea of durable development. “These countries – such as Italy and Spain – find money to support the banks when they’re in trouble. But they’re not paying for the lives of people. How can you accept that?” As the International Aids Society‘s president-elect, Prof Barre-Sinoussi is leading efforts for a research strategy which could come up with a cure for HIV, or at least a mechanism which drives the virus into remission. She acknowledges that a vaccine against HIV is still “a missing piece” in the jigsaw – but believes remission is an achievable objective. In a statement to mark World Aids Day, Oxfam said the pledge made by governments in June to increase the number of people receiving HIV treatment to 15 million by 2015 would be worthless without additional resources. Oxfam said Italy, Germany, Japan, Spain and the European Union have all either delayed or cancelled payments to the Global Fund.